Randy was born in Chicago and raised in Rock Island. He attended Rock Island High School and Augustana College earning a BA in Public Administration in 1980. Randy served in the United States Navy from 1981 until 1998. While in the Navy he attended the Air Command and Staff College in Montgomery, AL and earned an MPA from Auburn University at Montgomery. After completing his service in the Navy, Randy and his wife, Anjel, moved to Chicago and then, following the birth of their son, Jackson, to Rock Island. Randy began career with the City of Rock Island in 2000 as the Information Management Project Manager. In 2003 he transferred to Public Works where he served as the Technical Services Manager and later the Street Maintenance Superintendent. 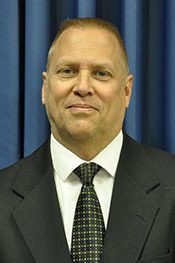 Randy was appointed as the Public Works Director in 2013. Randy has since taken on the City Manager role when he was appointed by the City Council in June of 2017.